Jeremiah Trotter (born January 20,1977 in Hooks,Texas) He was originally drafted by the Philadelphia Eagles in the third round (72nd overall) of the 1998 NFL Draft. He played college football at Stephen Austin. 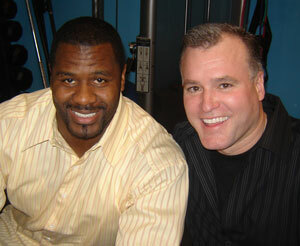 He was drafted by the Philadelphia Eagles in the 3rd round of th1998 NFL Draft . In his first year with the Eagles as a backup, he recorded only 6 tackles. After that year he got a starting job at middle linebacker. In the 1999 season he recorded a total of 174 tackles to lead the team. The next year he recorded 164 tackles and again led the team. He is a Philadelphia Eagles Favorite.